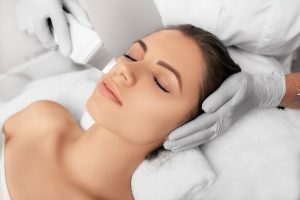 High Intensity Focused Ultrasound, also known as ‘Ultrasound Facelift’ or ‘Ultherapy’, has become one of the most sought after lifting treatments for the face, neck and body. It is a revolutionary medical alternative to surgical facelift. Surgical facelift is more expensive, requires much more downtime and is much more painful. HIFU targets multiple layers of the skin including the superficial muscular aponeurotic system (SMAS), which is the same layer adjusted by surgeons during a facelift. HIFU lifts and tones the face, neck and eyes resulting in a dramatic yet natural uplift, without surgery. Results may last up to 2 years. HIFU treatment is rapidly gaining popularity in Islamabad, Pakistan. 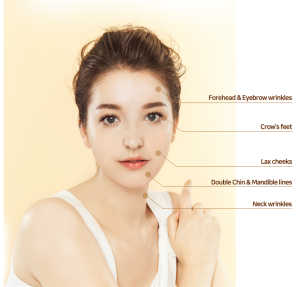 Though other non-invasive treatments have had promising results, the ability to target multiple layers beneath the skin is what sets HIFU apart. Unlike surgery, high-intensity focused ultrasound is safe, affordable and doesn’t require you to have downtime following the treatment. You can have HIFU and leave everyone you know wonder how you keep your skin so thight and strong. The treatment is able to target the deep structural layers of the skin. 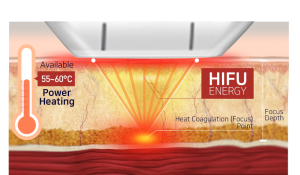 HIFU uses ultrasound energy to apply thermal energy (heat) to specific depths of the skin which boosts the body’s healing responses. This naturally increases the production of collagen and elastin in the tissues, helping to reduce the sign of ageing: The result is a younger and more refreshed appearance. The price depends on the area you wish to treat. The smaller the area that needs treatment the less the cost. We use a highly advanced High Intensity Focused Ultrasound (HIFU) at our Islamabad clinic. Depending on the area we need to treat we can target skin structures at 1.5 mm, 3 mm, 4.5 mm and 13 mm depth. Very few clinics have this variety in depth adjustments according to the patients needs. The machine delivers a ultrasonic energy that converts into thermal energy that induces production of elasting and collagen and thigtens the muscles with a more pronounced effect than any other non-surgical treatment. HIFU truly is a new era in medical facelift, skin treatment, skin tightning and skin rejuvenation. The thermal energy creates a reaction in the skin that leads to collagen and elastic production. Thereby rejuvenating the skin the way nature rejuvenates. HIFU is safe and suitable for most people over 20-25 years of age. Although it is safe younger patients would normally not require HIFU treatment. Some young patients may need it for double chin treatment or other specifik purposes. HIFU will stimulate collagen and elastin production to help lift and tighten the treated area to help delay the ageing process. What can be treated using HIFU? HIFU is useful for treatment of the face and the body. We’ve specially designed handpieces for each area on the face and body. Most people do not report pain. There can be slight aching over bony areas or a warm sensation in the skin during treatment. If required a topical anaesthetic cream can be applied. One of the benefits of this treatment is that there is no downtime. Most people return to normal activities right away. Few patient may have slight redness, swelling or tenderness in the treated area. There may be slight redness, swelling or tenderness to the treated area following the session. Some patients may feel tingling and tenderness to the touch after the treatment. SPF30 is recommended when in the sun (as always). Can HIFU be combined with other treatments? HIFU can be used along with other treatments to enhance results. Looking for skin rejuvenation, Vampire Facelift, better hair or sexual rejuvenation? Then PRP may be what you are looking for. Send your details and we’ll contact you with an amazing Offer! !